The Kistler Group celebrated the opening of its new office in Shanghai on 5 February, on the occasion of the Chinese New Year festival. 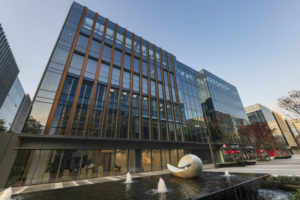 The new building strengthens the Swiss corporation’s presence on the Chinese market, enabling it to offer products and services from one single source to local customers in the future. “We see the opening of our new branch in Shanghai as the next logical step in our global corporate strategy,” Kistler’s CEO Rolf Sonderegger comments. “This office is not only the future hub for all Kistler’s Chinese projects: it will also strengthen communication with our customers on the ground in China. It now puts us in a better position to assist them with comprehensive service, sales and technical support.” Sonderegger opened the ultramodern building at a festive ceremony attended by the entire workforce and many of the company’s customers. The new office is located in the Shanghai-Hongqiao Business Park – just a stone’s throw from China’s National Exhibition and Convention Center, with excellent access to expressways, the rail station and the airport. With an area of some 4 200 m2, the seven-story building accommodates state-of-the-art workplaces for about 100 employees, bringing the entire know-how of Kistler’s Automotive Research & Test, Sensor Technology and Industrial Process Control Divisions together under one roof. The building also houses a Tech Center to support customers with services such as calibration, training, technical adaptations and repairs. Another outstanding feature is the vast exhibition space in the entrance area, which includes an application-based presentation of Kistler’s concept for Industry 4.0 alongside the company’s latest products and solutions. The Kistler Group, headquartered in Winterthur (Switzerland), has already been represented on the Chinese market for over 20 years. In fall 2018, the family-managed corporation acquired LIK, the Chinese special-purpose machinery manufacturer: as well as strengthening its presence in China’s dynamic vehicle market, this step has expanded Kistler’s industrial expertise by adding the manufacture of automated production lines to the portfolio, with a focus on the rapidly growing electric vehicle sector.